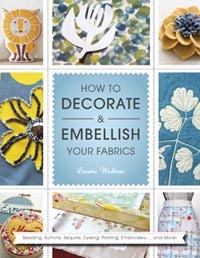 Comprehensive step-by-step instructions are accompanied by detailed illustrations that introduce readers to an extensive range of fabric alteration and embellishment techniques, such as tie-dyeing, block printing, and beading. Crafters will be fully equipped with all the information they need, allowing them the freedom to apply these techniques to any number of fabric projects, from tote bags and clothes to cushion covers, lamp shades, and soft furnishings. Galleries throughout the book feature examples of these techniques, demonstrating how they have been applied to fabric and providing readers with a wealth of inspiration.